Subsys Review 2019: Is Subsys a Good Hosting? 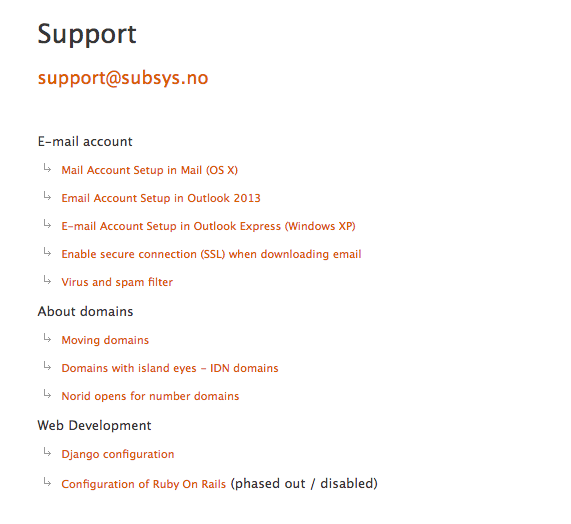 Subsys offers affordable Norwegian hosting with SSD storage. Likely not a perfect fit for most beginners, the plans, however, include nearly everything required for experts. Subsys is a Norwegian company which was founded in 2002. Owning and operating its own servers and networks, its goal is to offer “high-quality server services at a decent price”. The simple website is available in Norwegian only. First, it’s worth pointing out, if your website can’t afford any downtime, there isn’t an uptime SLA on this website (I tried to contact support but did not hear back). However, the servers are located in Norway and it’s reassuring to know that they are operated 100% by Subsys. The control panel has been developed by Subsys, so instead of using a well-known brand like Plesk or cPanel, you will have a custom dashboard. The upside is Subsys has detailed knowledge of the panel and can more easily adapt it to meet customer needs. The plans seem to be primarily geared towards more advanced users. As far as I can tell from the website, there isn’t a website building tool or a one-click installer. On the other hand, there are all the scripting and database features you’d expect like MySQL databases, phpMyAdmin, and support for PHP up to version 7.1. If speed is important to you, you’ll be pleased to know that SSD storage is used, which should mean disk read/write speeds up to ten times faster than traditional HDD. Given this is a Norwegian company, which are typically quite expensive, the prices are in line or only very slightly more expensive than similar companies. You do get a free domain name and SSL certificate, which certainly reduces the overall cost. Be sure to check the resource allocations as they are limited e.g., the base plan only includes three domains and 1GB of disk space. The plans can be bought in one-month or one-year terms, however, there’s no long term discount applicable. Customer support is fairly basic. It only includes telephone and email, with a minimal knowledge base on the website. Ideally, I’d like to see a few more methods to get in touch or at least business hours advertised. I sent the team an email mid-morning on a weekday via the online contact form. I really wanted clarification on the uptime, however, despite waiting a few days for a reply, I did not hear back. Subsys is a Norwegian host offering SSD hosting. Compared to local providers, it’s well-priced and, unless you need beginner-friendly features, which are presumed to be limited, the plans include everything you need. Buy Norwegian hosting at Subsys! Wondering how Subsys stacks up against other Web Hosting companies? Enter any other Web Hosting company and we will give you a side-by-side comparison.